If you are using any of our theme(s), please DO NOT hide or remove the "Theme Powered by Striving Programmers" copyright and back-link, in the footer from your site (as the link comes embedded in all of the themes that are available here). The "powered by" link is simply a way to say "thank you" and give us a credit for putting time and effort in creating / customizing theme(s) for you and making it available for FREE (or lower price - in case of paid themes). One single order of Striving Programmers Copyright Removal Key is applicable for ONE theme ONLY. Question: Do I have to buy a copyright removal key if I plan on using your theme? Answer: You do not "have" to buy this copyright removal key if you plan on using any of the FREE theme(s) available on Striving Programmers site as long as you keep the "Theme Powered by Striving Programmers" copyright and back-link on the footer of your website that came with our theme. The "powered by" link is simply a way to say "thank you" and give us a credit for putting time and effort in creating / customizing theme(s) for you and making it available for FREE. Question: If the theme is available for FREE then why I should buy this copyright removal key? Question: If I am buying a PAID theme then why I should buy this copyright removal key? 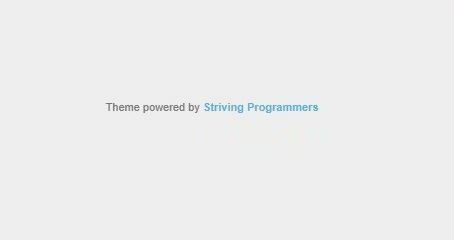 Answer: All the themes offered by Striving Programmers comes with a "Theme Powered by Striving Programmers" copyright statement. With the copyright statement we are able to offer PAID / highly customized themes at a very low price. IMPORTANT NOTE: Themes offered by Striving Programmers DOES NOT give you a right to remove any other copyright statement that comes with the default application / software. Please obey all copyrights (if any) that are linked with the application / software you are using.